The blood–brain barrier (BBB) is a highly selective permeability barrier that separates the circulating blood from the brain extracellular fluid in the central nervous system (CNS). The blood–brain barrier is formed by brain endothelial cells, which are connected by tight junctions. The blood–brain barrier allows the passage of water, some gases, and lipid-soluble molecules by passive diffusion, as well as the selective transport of molecules such as glucose and amino acids that are crucial to neural function. Furthermore, it prevents the entry of lipophilic potential neurotoxins by way of an active transport mechanism mediated by P-glycoprotein. Astrocytes are necessary to create the blood–brain barrier. A few regions in the brain, including the circumventricular organs, do not have a blood–brain barrier. The blood–brain barrier occurs along all capillaries and consists of tight junctions around the capillaries that do not exist in normal circulation. Endothelial cells restrict the diffusion of microscopic objects (e.g., bacteria) and large or hydrophilic molecules into the cerebrospinal fluid (CSF), while allowing the diffusion of small or hydrophobic molecules (O2, CO2, hormones). Cells of the barrier actively transport metabolic products such as glucose across the barrier with specific proteins. This barrier also includes a thick basement membrane and astrocytic endfeet. This "barrier" results from the selectivity of the tight junctions between endothelial cells in CNS vessels that restricts the passage of solutes. At the interface between blood and the brain, endothelial cells are stitched together by these tight junctions, which are composed of smaller subunits, frequently biochemical dimers, that are transmembrane proteins such as occludin, claudins, junctional adhesion molecule (JAM), or ESAM, for example. Each of these transmembrane proteins is anchored into the endothelial cells by another protein complex that includes zo-1 and associated proteins. The blood–brain barrier is composed of high-density cells restricting passage of substances from the bloodstream much more than do the endothelial cells in capillaries elsewhere in the body. Astrocyte cell projections called astrocytic feet (also known as "glia limitans") surround the endothelial cells of the BBB, providing biochemical support to those cells. The BBB is distinct from the quite similar blood–cerebrospinal fluid barrier, which is a function of the choroidal cells of the choroid plexus, and from the blood–retinal barrier, which can be considered a part of the whole realm of such barriers. Several areas of the human brain are not on the brain side of the BBB. Some examples of this include the circumventricular organs, the roof of the third and fourth ventricles, capillaries in the pineal gland on the roof of the diencephalon and the pineal gland. The pineal gland secretes the hormone melatonin "directly into the systemic circulation", thus melatonin is not affected by the blood–brain barrier. Originally, experiments in the 1920s seemed to show that the blood–brain barrier (BBB) was still immature in newborns. The reason for this mistake was an error in methodology (the osmotic pressure was too high and the delicate embryonal capillary vessels were partially damaged). It was later shown in experiments with a reduced volume of the injected liquids that the markers under investigation could not pass the BBB. It was reported that those natural substances such as albumin, α-1-fetoprotein or transferrin with elevated plasma concentration in the newborn could not be detected outside of cells in the brain. The transporter P-glycoprotein exists already in the embryonal endothelium. The measurement of brain uptake of acetamide, antipyrine, benzyl alcohol, butanol, caffeine, cytosine, phenytoin, ethanol, ethylene glycol, heroin, mannitol, methanol, phenobarbital, propylene glycol, thiourea, and urea in ether-anesthetized newborns vs. adult rabbits shows that newborn rabbit and adult rabbit brain endothelia are functionally similar with respect to lipid-mediated permeability. These data confirmed that no differences in permeability could be detected between newborn and adult BBB capillaries. No difference in brain uptake of glucose, amino acids, organic acids, purines, nucleosides, or choline was observed between adult and newborn rabbits. These experiments indicate that the newborn BBB has restrictive properties similar to that of the adult. In contrast to suggestions of an immature barrier in young animals, these studies indicate that a sophisticated, selective BBB is operative at birth. The blood–brain barrier acts very effectively to protect the brain from most pathogens. Thus, blood-borne infections of the brain are very rare. Infections of the brain that do occur are often very serious and difficult to treat. Antibodies are too large to cross the blood–brain barrier, and only certain antibiotics are able to pass. In some cases, a drug has to be administered directly into the cerebrospinal fluid (CSF), where it can enter the brain by crossing the blood–cerebrospinal fluid barrier. However, not all drugs that are delivered directly to the CSF can effectively penetrate the CSF barrier and enter the brain. The blood–brain barrier becomes more permeable during inflammation. This allows some antibiotics and phagocytes to move across the BBB. However, this also allows bacteria and viruses to infiltrate the BBB. Examples of pathogens that can traverse the BBB and the diseases they cause include toxoplasma gondii which causes toxoplasmosis, spirochetes like Borrelia which causes Lyme disease, Group B streptococci which causes meningitis in newborns, and Treponema pallidum which causes syphilis. Some of these harmful bacteria gain access by releasing cytotoxins like pneumolysin which have a direct toxic effect on brain microvascular endothelium and tight junctions. There are also some biochemical poisons that are made up of large molecules that are too big to pass through the blood–brain barrier. This was especially important in more primitive times when people often ate contaminated food. 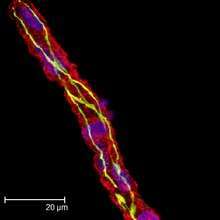 Neurotoxins such as botulinum in the food might affect peripheral nerves, but the blood–brain barrier can often prevent such toxins from reaching the central nervous system, where they could cause serious or fatal damage. The blood–brain barrier (BBB) is formed by the brain capillary endothelium and excludes from the brain ∼100% of large-molecule neurotherapeutics and more than 98% of all small-molecule drugs. Overcoming the difficulty of delivering therapeutic agents to specific regions of the brain presents a major challenge to treatment of most brain disorders. In its neuroprotective role, the blood–brain barrier functions to hinder the delivery of many potentially important diagnostic and therapeutic agents to the brain. Therapeutic molecules and antibodies that might otherwise be effective in diagnosis and therapy do not cross the BBB in adequate amounts. Mechanisms for drug targeting in the brain involve going either "through" or "behind" the BBB. Modalities for drug delivery/Dosage form through the BBB entail its disruption by osmotic means; biochemically by the use of vasoactive substances such as bradykinin; or even by localized exposure to high-intensity focused ultrasound (HIFU). Other methods used to get through the BBB may entail the use of endogenous transport systems, including carrier-mediated transporters such as glucose and amino acid carriers; receptor-mediated transcytosis for insulin or transferrin; and the blocking of active efflux transporters such as p-glycoprotein. However, vectors targeting BBB transporters, such as the transferrin receptor, have been found to remain entrapped in brain endothelial cells of capillaries, instead of being ferried across the BBB into the cerebral parenchyma. Methods for drug delivery behind the BBB include intracerebral implantation (such as with needles) and convection-enhanced distribution. Mannitol can be used in bypassing the BBB. Nanotechnology may also help in the transfer of drugs across the BBB. Recently, researchers have been trying to build liposomes loaded with nanoparticles to gain access through the BBB. More research is needed to determine which strategies will be most effective and how they can be improved for patients with brain tumors. The potential for using BBB opening to target specific agents to brain tumors has just begun to be explored. Delivering drugs across the blood–brain barrier is one of the most promising applications of nanotechnology in clinical neuroscience. Nanoparticles could potentially carry out multiple tasks in a predefined sequence, which is very important in the delivery of drugs across the blood–brain barrier. A significant amount of research in this area has been spent exploring methods of nanoparticle-mediated delivery of antineoplastic drugs to tumors in the central nervous system. For example, radiolabeled polyethylene glycol coated hexadecylcyanoacrylate nanospheres targeted and accumulated in a rat gliosarcoma. However, this method is not yet ready for clinical trials, due to the accumulation of the nanospheres in surrounding healthy tissue. Another, more promising approach, is the coating of polyalkylcyanoacrylate or poly-lactic-co-glycolic acid (PLGA) nanoparticles with polysorbate 80 or poloxamer 188. Due to this coating the particles adsorb apolipoproteins E or A-1 from the blood and thus interact with the LRP1 or with the scavenger receptor followed by transcytosis across the blood-brain barrier into the brain. These particles loaded with doxorubicin for the treatment of glioblastomas are presently in Clinical Phase I. Recently, a novel class of multifunctional nanoparticles known as magneto-electric nanoparticles (MENs) has been discovered for externally controlled targeted delivery and release of drug(s) across BBB as well as wireless stimulation of cells deep in the brain. This approach depends more on the field control and less on the cellular microenvironment. In vitro and in vivo (on mice) experiments to prove the feasibility of using MENs to release a drug across BBB on demand and wirelessly stimulate the brain have been conducted by the research group of Prof. Sakhrat Khizroev at Florida International University (FIU). It should be noted that vascular endothelial cells and associated pericytes are often abnormal in tumors and that the blood–brain barrier may not always be intact in brain tumors. Also, the basement membrane is sometimes incomplete. Other factors, such as astrocytes, may contribute to the resistance of brain tumors to therapy. Peptides are able to cross the blood–brain barrier (BBB) through various mechanisms, opening new diagnostic and therapeutic avenues. However, their BBB transport data are scattered in the literature over different disciplines, using different methodologies reporting different influx or efflux aspects. Therefore, a comprehensive BBB peptide database (Brainpeps) was constructed to collect the BBB data available in the literature. Brainpeps currently contains BBB transport information with positive as well as negative results. The database is a useful tool to prioritize peptide choices for evaluating different BBB responses or studying quantitative structure-property (BBB behaviour) relationships of peptides. Because a multitude of methods have been used to assess the BBB behaviour of compounds, we classified these methods and their responses. Moreover, the relationships between the different BBB transport methods have been clarified and visualized. Casomorphin is a heptapeptide and could be able to pass the BBB. Meningitis is an inflammation of the membranes that surround the brain and spinal cord (these membranes are known as meninges). Meningitis is most commonly caused by infections with various pathogens, examples of which are Streptococcus pneumoniae and Haemophilus influenzae. When the meninges are inflamed, the blood–brain barrier may be disrupted. This disruption may increase the penetration of various substances (including either toxins or antibiotics) into the brain. 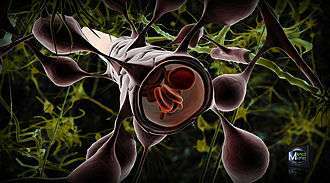 Antibiotics used to treat meningitis may aggravate the inflammatory response of the central nervous system by releasing neurotoxins from the cell walls of bacteria - like lipopolysaccharide (LPS). Depending on the causative pathogen, whether it is bacterial, fungal, or protozoan, treatment with third-generation or fourth-generation cephalosporin or amphotericin B is usually prescribed. A brain or cerebral abscess, like other abscesses, is caused by inflammation and collection of lymphatic cells and infected material originating from a local or remote infection. Brain abscess is a rare, life-threatening condition. Local sources may include infections of the ear, the oral cavity and teeth, the paranasal sinuses, or epidural abscess. Remote sources may include infections in the lung, heart or kidney. A brain abscess may also be caused by head trauma or as a complication of surgery. In children cerebral abscesses are usually linked to congenital heart disease. In most cases, 8–12 weeks of antibacterial therapy is required. Epilepsy is a common neurological disease that is characterized by recurrent and sometimes untreatable seizures. Several clinical and experimental data have implicated the failure of blood–brain barrier function in triggering chronic or acute seizures. Some studies implicate the interactions between a common blood protein (albumin) and astrocytes. These findings suggest that acute seizures are a predictable consequence of disruption of the BBB by either artificial or inflammatory mechanisms. In addition, expression of drug resistance molecules and transporters at the BBB are a significant mechanism of resistance to commonly used anti-epileptic drugs. Multiple sclerosis (MS) is considered to be an auto-immune and neurodegenerative disorder in which the immune system attacks the myelin that protects and electrically insulates the neurons of the central and peripheral nervous systems. 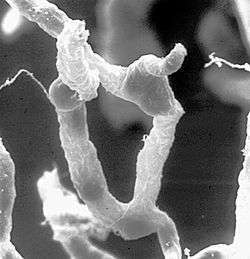 Normally, a person's nervous system would be inaccessible to the white blood cells due to the blood–brain barrier. However, magnetic resonance imaging has shown that when a person is undergoing an MS "attack," the blood–brain barrier has broken down in a section of the brain or spinal cord, allowing white blood cells called T lymphocytes to cross over and attack the myelin. It has sometimes been suggested that, rather than being a disease of the immune system, MS is a disease of the blood–brain barrier. The weakening of the blood–brain barrier may be a result of a disturbance in the endothelial cells on the inside of the blood vessel, due to which the production of the protein P-glycoprotein is not working well. There are currently active investigations into treatments for a compromised blood–brain barrier. It is believed that oxidative stress plays an important role into the breakdown of the barrier. Anti-oxidants such as lipoic acid may be able to stabilize a weakening blood–brain barrier. Neuromyelitis optica, also known as Devic's disease, is similar to and is often confused with multiple sclerosis. Among other differences from MS, a different target of the autoimmune response has been identified. Patients with neuromyelitis optica have high levels of antibodies against a protein called aquaporin 4 (a component of the astrocytic foot processes in the blood–brain barrier). Late-stage neurological trypanosomiasis, or sleeping sickness, is a condition in which trypanosoma protozoa are found in brain tissue. It is not yet known how the parasites infect the brain from the blood, but it is suspected that they cross through the choroid plexus, a circumventricular organ. Progressive multifocal leukoencephalopathy (PML) is a demyelinating disease of the central nervous system that is caused by reactivation of a latent papovavirus (the JC polyomavirus) infection, that can cross the BBB. It affects immune-compromised patients and it is usually seen with patients suffering from AIDS. De Vivo disease (also known as GLUT1 deficiency syndrome) is a rare condition caused by inadequate transportation of the sugar glucose across the blood–brain barrier, resulting in developmental delays and other neurological problems. Genetic defects in glucose transporter type 1 (GLUT1) appears to be the primary cause of De Vivo disease. Some evidence indicates that disruption of the blood–brain barrier in Alzheimer's disease patients allows blood plasma containing amyloid beta (Aβ) to enter the brain where the Aβ adheres preferentially to the surface of astrocytes. These findings have led to the hypotheses that (1) breakdown of the blood–brain barrier allows access of neuron-binding autoantibodies and soluble exogenous Aβ42 to brain neurons and (2) binding of these auto-antibodies to neurons triggers and/or facilitates the internalization and accumulation of cell surface-bound Aβ42 in vulnerable neurons through their natural tendency to clear surface-bound autoantibodies via endocytosis. Eventually the astrocyte is overwhelmed, dies, ruptures, and disintegrates, leaving behind the insoluble Aβ42 plaque. Thus, in some patients, Alzheimer's disease may be caused (or more likely, aggravated) by a breakdown in the blood–brain barrier. Cerebral edema is the accumulation of excess water in the extracellular space of the brain, which can result when hypoxia causes the blood–brain barrier to open. Many neurodegenerative diseases including alpha-synucleinopathies (Parkinson's, PSP, DLBP) and tauopathies (Alzheimer's) are thought to result from seeded misfolding from pathological extracellular protein variants. This prion-like hypothesis is gaining support in numerous studies in vitro and involving in vivo intracerebral injection of brain lysates, extracted protein (tau, alpha-synuclein) and synthetically generated fibers (PFFs in alpha-synucleinopathies). These proteins are also detectable in increasing amounts in the plasma of patients suffering from these conditions (particularly total alpha-synuclein in Parkinson's disease patients). The extent to which and the mechanisms by which these prion-like proteins can penetrate the blood–brain barrier is currently unknown. It is believed that latent HIV can cross the blood–brain barrier inside circulating monocytes in the bloodstream ("Trojan horse theory") within the first 14 days of infection. Once inside, these monocytes become activated and are transformed into macrophages. Activated macrophages release virions into the brain tissue proximate to brain microvessels. These viral particles likely attract the attention of sentinel brain microglia and perivascular macrophages initiating an inflammatory cascade that may cause a series of intracellular signaling in brain microvascular endothelial cells and damage the functional and structural integrity of the BBB. This inflammation is HIV encephalitis (HIVE). Instances of HIVE probably occur throughout the course of AIDS and are a precursor for HIV-associated dementia (HAD). The premier model for studying HIV and HIVE is the simian model. During lethal rabies infection of mice, the blood–brain barrier (BBB) does not allow anti-viral immune cells to enter the brain, the primary site of rabies virus replication. This aspect contributes to the pathogenicity of the virus and artificially increasing BBB permeability promotes viral clearance. Opening the BBB during rabies infection has been suggested as a possible novel approach to treating the disease, even though no attempts have yet been made to determine whether or not this treatment could be successful. Inflammation in the body may lead to effects on the brain via the blood-brain barrier (BBB). During systemic inflammation, whether in the form of infection or sterile inflammation, the BBB may undergo changes which may be disruptive or non-disruptive. Such changes may be part of a productive host response to systemic inflammation, or may lead to deleterious consequences within the central nervous system. These BBB changes likely play a role in the generation of sickness behaviour during systemic infection (why we feel 'unwell' when we have an infection). These changes may also induce or accelerate disease within the brain, for example in multiple sclerosis and Alzheimer's disease, and may be part of the reason why patients with these conditions can deteriorate during an infection. Also, in patients with neurological disease the BBB may be abnormally sensitive to the effects of systemic inflammation. Paul Ehrlich was a bacteriologist studying staining, a procedure that is used in many microscopic studies to make fine biological structures visible using chemical dyes. As Ehrlich injected some of these dyes (notably the aniline dyes that were then widely used), the dye stained all of the organs of some kinds of animals except for their brains. At that time, Ehrlich attributed this lack of staining to the brain simply not picking up as much of the dye. However, in a later experiment in 1913, Edwin Goldmann (one of Ehrlich's students) injected the dye into the cerebro-spinal fluids of animals' brains directly. He found that in this case the brains did become dyed, but the rest of the body did not. This clearly demonstrated the existence of some sort of compartmentalization between the two. At that time, it was thought that the blood vessels themselves were responsible for the barrier, since no obvious membrane could be found. The concept of the blood–brain barrier (then termed hematoencephalic barrier) was proposed by a Berlin physician, Lewandowsky, in 1900. It was not until the introduction of the scanning electron microscope to the medical research fields in the 1960s that the actual membrane could be observed and proved to exist. ↑ de Vries, Helga E.; Kuiper, Johan; de Boer, Albertus G.; Van Berkel, Theo J. C.; Breimer, Douwe D. (1997). "The Blood-Brain Barrier in Neuroinflammatory Diseases". Pharmacological Reviews. 49 (2): 143–55. PMID 9228664. ↑ "About". Blood Brain Barrier. Johns Hopkins University. Retrieved 7 May 2013. 1 2 3 Stamatovic, Svetlana M.; Keep, Richard F.; Andjelkovic, Anuska V. (2008). "Brain Endothelial Cell-Cell Junctions: How to 'Open' the Blood Brain Barrier". Current Neuropharmacology. 6 (3): 179–92. doi:10.2174/157015908785777210. PMC 2687937 . PMID 19506719. ↑ Ballabh, Praveen; Braun, Alex; Nedergaard, Maiken (2004). "The blood–brain barrier: an overview: Structure, regulation, and clinical implications". Neurobiology of Disease. 16 (1): 1–13. doi:10.1016/j.nbd.2003.12.016. PMID 15207256. 1 2 Pardridge, William M. (2005). "The blood-brain barrier: Bottleneck in brain drug development". NeuroRX. 2 (1): 3–14. doi:10.1602/neurorx.2.1.3. PMC 539316 . PMID 15717053. ↑ Abbott, N. Joan; Rönnbäck, Lars; Hansson, Elisabeth (2006). "Astrocyte–endothelial interactions at the blood–brain barrier". Nature Reviews Neuroscience. 7 (1): 41–53. doi:10.1038/nrn1824. PMID 16371949. ↑ Hamilton, R. D.; Foss, A. J.; Leach, L. (2007). "Establishment of a humanin vitromodel of the outer blood-retinal barrier". Journal of Anatomy. 211 (6): 707–16. doi:10.1111/j.1469-7580.2007.00812.x. PMC 2375847 . PMID 17922819. ↑ Pritchard, Thomas C.; Alloway, Kevin Douglas (1999). Medical Neuroscience (Google books preview). Hayes Barton Press. pp. 76–77. ISBN 1-889325-29-5. Retrieved 2009-02-08. ↑ Gilgun-Sherki, Yossi; Melamed, Eldad; Offen, Daniel (2001). "Oxidative stress induced-neurodegenerative diseases: the need for antioxidants that penetrate the blood brain barrier". 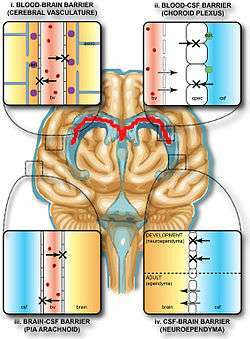 Neuropharmacology. 40 (8): 959–75. doi:10.1016/S0028-3908(01)00019-3. PMID 11406187. ↑ Tsai, Catherine E.; Daood, Monica J.; Lane, Robert H.; Hansen, Thor W.R.; Gruetzmacher, Elisa M.; Watchko, Jon F. (2002). "P-Glycoprotein Expression in Mouse Brain Increases with Maturation". Neonatology. 81 (1): 58–64. doi:10.1159/000047185. PMID 11803178. 1 2 Braun, Leon D.; Cornford, Eain M.; Oldendorf, William H. (1980). "Newborn Rabbit Blood–Brain Barrier Is Selectively Permeable and Differs Substantially from the Adult". Journal of Neurochemistry. 34 (1): 147–52. doi:10.1111/j.1471-4159.1980.tb04633.x. PMID 7452231. 1 2 3 4 Raza, Muhammad W.; Shad, Amjad; Pedler, Steve J; Karamat, Karamat A. (2005). "Penetration and activity of antibiotics in brain abscess". Journal of the College of Physicians and Surgeons Pakistan. 15 (3): 165–7. PMID 15808097. ↑ Pardridge, William M (2011). "Drug transport in brain via the cerebrospinal fluid". Fluids Barriers CNS. 8 (1): 7. doi:10.1186/2045-8118-8-7. PMC 3042981 . PMID 21349155. ↑ Chen, Y (2013). "Novel modified method for injection into the cerebrospinal fluid via the cerebellomedullary cistern in mice". Acta Neurobiologiae Experimentalis. 73 (2): 304–11. PMID 23823990. ↑ Tortora, Gerard J.; Berdell R. Funke; Christine L. Case (2010). Microbiology: An Introduction. San Francisco: Benjamin Cummings. p. 439,611. ISBN 0-321-55007-2. ↑ Nizet, V; KS, Kim; M, Stins; M, Jonas; EY, Chi; D, Nguyen; CE, Rubens (1997). "Invasion of brain microvascular endothelial cells by group B streptococci.". Infection and Immunity. 65 (12): 5074–5081. PMC 175731 . PMID 9393798. ↑ Zysk, Gregor (2001). "Pneumolysin Is the Main Inducer of Cytotoxicity to Brain Microvascular Endothelial Cells Caused by Streptococcus pneumoniae". Infection and Immunity. 69 (2): 845–852. doi:10.1128/IAI.69.2.845-852.2001. PMC 97961 . PMID 11159977. ↑ Van Sorge, Nina M (2012). "Defense at the border: the blood–brain barrier versus bacterial foreigners". Future Microbiol. 7 (3): 383–394. doi:10.2217/fmb.12.1. PMC 3589978 . PMID 22393891. ↑ Tortora, Gerard J.; Berdell R. Funke; Christine L. Case (2010). Microbiology: An Introduction. San Francisco: Benjamin Cummings. pp. 616–618. ISBN 0-321-55007-2. ↑ Marcos-Contreras, O. A.; Martinez de Lizarrondo, S.; Bardou, I.; Orset, C.; Pruvost, M.; Anfray, A.; Frigout, Y.; Hommet, Y.; Lebouvier, L.; Montaner, J.; Vivien, D.; Gauberti, M. (2016). "Hyperfibrinolysis increases blood brain barrier permeability by a plasmin and bradykinin-dependent mechanism". Blood. doi:10.1182/blood-2016-03-705384. PMID 27531677. ↑ McDannold, Nathan; Vykhodtseva, Natalia; Hynynen, Kullervo (May 2008). "Blood–brain barrier disruption induced by focused ultrasound and circulating preformed microbubbles appears to be characterized by the mechanical index". Ultrasound in Medicine and Biology. Elsevier. 34 (5): 834–840. doi:10.1016/j.ultrasmedbio.2007.10.016. PMC 2442477 . PMID 18207311. ↑ Wiley, Devin (2013). "Transcytosis and brain uptake of transferrin-containing nanoparticles by tuning avidity to transferrin receptor". Proc Natl Acad Sci U S A. 110 (21): 8662–7. Bibcode:2013PNAS..110.8662W. doi:10.1073/pnas.1307152110. PMC 3666717 . PMID 23650374. ↑ Paris-Robidas S, Emond V, Tremblay C, Soulet D, Calon F (July 2011). "In vivo labeling of brain capillary endothelial cells after intravenous injection of monoclonal antibodies targeting the transferrin receptor". Molecular Pharmacology. 80 (1): 32–9. doi:10.1124/mol.111.071027. PMID 21454448. ↑ Krol, Silke; MacRez, Richard; Docagne, Fabian; Defer, Gilles; Laurent, Sophie; Rahman, Masoud; Hajipour, Mohammad J.; Kehoe, Patrick G.; Mahmoudi, Morteza (2013). "Therapeutic Benefits from Nanoparticles: The Potential Significance of Nanoscience in Diseases with Compromise to the Blood Brain Barrier". Chemical Reviews. 113 (3): 1877–1903. doi:10.1021/cr200472g. PMID 23157552. ↑ Silva, GA (December 2008). "Nanotechnology approaches to crossing the blood–brain barrier and drug delivery to the CNS". BMC Neuroscience. 9: S4. doi:10.1186/1471-2202-9-S3-S4. PMC 2604882 . PMID 19091001. ↑ Brigger, I.; Morizet, J; Aubert, G; Chacun, H; Terrier-Lacombe, MJ; Couvreur, P; Vassal, G (December 2002). "Poly(ethylene glycol)-coated hexadecylcyanoacrylate nanospheres display a combined effect for brain tumor targeting". J. Pharmacol. Exp. Ther. 303 (3): 928–36. doi:10.1124/jpet.102.039669. PMID 12438511. ↑ Kreuter, Jörg (2014). "Drug delivery to the central nervous system by polymeric nanoparticles: What do we know?". Advanced Drug Delivery Reviews. 71: 2–14. doi:10.1016/j.addr.2013.08.008. PMID 23981489. ↑ Nair, Madhavan; Guduru, Rakesh; Liang, Ping; Hong, Jeongmin; Sagar, Vidya; Khizroev, Sakhrat (2013). "Externally controlled on-demand release of anti-HIV drug using magneto-electric nanoparticles as carriers". Nature Communications. 4: 1707. Bibcode:2013NatCo...4E1707N. doi:10.1038/ncomms2717. PMID 23591874. ↑ Hashizume, Hiroya; Baluk, Peter; Morikawa, Shunichi; McLean, John W.; Thurston, Gavin; Roberge, Sylvie; Jain, Rakesh K.; McDonald, Donald M. (April 2000). "Openings between Defective Endothelial Cells Explain Tumor Vessel Leakiness". American Journal of Pathology. 156 (4): 1363–1380. doi:10.1016/S0002-9440(10)65006-7. PMC 1876882 . PMID 10751361. ↑ Schneider, Stefan W.; Ludwig, Thomas; Tatenhorst, Lars; Braune, Stephan; Oberleithner, Hans; Senner, Volker; Paulus, Werner (March 2004). "Glioblastoma cells release factors that disrupt blood–brain barrier features". Acta Neuropathologica. 107 (3): 272–276. doi:10.1007/s00401-003-0810-2. PMID 14730455. ↑ Van Dorpe, Sylvia; Bronselaer, Antoon; Nielandt, Joachim; Stalmans, Sofie; Wynendaele, Evelien; Audenaert, Kurt; Van De Wiele, Christophe; Burvenich, Christian; Peremans, Kathelijne; Hsuchou, Hung; De Tré, Guy; De Spiegeleer, Bart (2012). "Brainpeps: the blood–brain barrier peptide database". Brain Structure and Function. 217 (3): 687–718. doi:10.1007/s00429-011-0375-0. PMID 22205159. ↑ "Transport at the Blood Brain Barrier". Davis Lab. Retrieved 5 January 2015. ↑ Ermisch, A.; Ruhle, H.-J. ; Neubert, K.; Hartrodt, B.; Landgraf, R. (1983). "On the Blood-Brain Barrier to Peptides: [3H]βCasomorphin-5 Uptake by Eighteen Brain Regions In Vivo". Journal of Neurochemistry. 41 (5): 1229–33. doi:10.1111/j.1471-4159.1983.tb00816.x. PMID 6619862. ↑ Beam, T. R.; Allen, J. C. (December 1977). "Blood, Brain, and Cerebrospinal Fluid Concentrations of Several Antibiotics in Rabbits with Intact and Inflamed Meninges". Antimicrobial Agents and Chemotherapy. 12 (6): 710–6. doi:10.1128/AAC.12.6.710. PMC 430009 . PMID 931369. ↑ Tortora, Gerard J.; Berdell R. Funke; Christine L. Case (2010). Microbiology: An Introduction. San Francisco: Benjamin Cummings. p. 615. ISBN 0-321-55007-2. ↑ Nordqvist, Christian (2010-04-16). "What Is A Brain Abscess (Cerebral Abscess)?". MNT Knowledge Center. Medical News Today. Archived from the original on 2010-04-18. ↑ Oby, Emily; Janigro, Damir (2006). "The Blood–Brain Barrier and Epilepsy". Epilepsia. 47 (11): 1761–1774. doi:10.1111/j.1528-1167.2006.00817.x. ISSN 0013-9580. PMID 17116015. ↑ Marchi, Nicola; Angelov, Lilyana; Masaryk, Thomas; Fazio, Vincent; Granata, Tiziana; Hernandez, Nadia; Hallene, Kerri; Diglaw, Tammy; Franic, Linda; Najm, Imad; Janigro, Damir (2007). "Seizure-Promoting Effect of Blood?Brain Barrier Disruption". Epilepsia. 48 (4): 732–42. doi:10.1111/j.1528-1167.2007.00988.x. PMID 17319915. ↑ Seiffert, E.; Dreier, JP; Ivens, S; Bechmann, I; Tomkins, O; Heinemann, U; Friedman, A (2004). "Lasting Blood-Brain Barrier Disruption Induces Epileptic Focus in the Rat Somatosensory Cortex". Journal of Neuroscience. 24 (36): 7829–36. doi:10.1523/JNEUROSCI.1751-04.2004. PMID 15356194. ↑ Uva, L.; Librizzi, L.; Marchi, N.; Noe, F.; Bongiovanni, R.; Vezzani, A.; Janigro, D.; De Curtis, M. (2008). "Acute induction of epileptiform discharges by pilocarpine in the in vitro isolated guinea-pig brain requires enhancement of blood–brain barrier permeability". Neuroscience. 151 (1): 303–12. doi:10.1016/j.neuroscience.2007.10.037. PMC 2774816 . PMID 18082973. ↑ Van Vliet, E. A.; Da Costa Araujo, S.; Redeker, S.; Van Schaik, R.; Aronica, E.; Gorter, J. A. (2007). "Blood–brain barrier leakage may lead to progression of temporal lobe epilepsy". Brain. 130 (2): 521–534. doi:10.1093/brain/awl318. ↑ Ivens, S.; Kaufer, D.; Flores, L. P; Bechmann, I.; Zumsteg, D.; Tomkins, O.; Seiffert, E.; Heinemann, U.; Friedman, A. (2007). "TGF-beta receptor-mediated albumin uptake into astrocytes is involved in neocortical epileptogenesis". Brain. 130 (Pt 2): 535–47. doi:10.1093/brain/awl317. PMID 17121744. ↑ Awasthi, Sanjay; Hallene, Kerri L; Fazio, Vince; Singhal, Sharad S; Cucullo, Luca; Awasthi, Yogesh C; Dini, Gabriele; Janigro, Damir (2005). "RLIP76, a non-ABC transporter, and drug resistance in epilepsy". BMC Neuroscience. 6: 61. doi:10.1186/1471-2202-6-61. PMC 1249579 . PMID 16188027. ↑ Löscher, Wolfgang; Potschka, Heidrun (2005). "Drug resistance in brain diseases and the role of drug efflux transporters". Nature Reviews Neuroscience. 6 (8): 591–602. doi:10.1038/nrn1728. PMID 16025095. ↑ Waubant, Emmanuelle (2006). "Biomarkers indicative of blood–brain barrier disruption in multiple sclerosis". Disease Markers. 22 (4): 235–44. doi:10.1155/2006/709869. PMC 3850823 . PMID 17124345. ↑ Schinkel AH (April 1999). "P-Glycoprotein, a gatekeeper in the blood–brain barrier". Advanced Drug Delivery Reviews. 36 (2–3): 179–194. doi:10.1016/S0169-409X(98)00085-4. PMID 10837715. ↑ Schreibelt, G; Musters, RJ; Reijerkerk, A; De Groot, LR; Van Der Pol, SM; Hendrikx, EM; Döpp, ED; Dijkstra, CD; Drukarch, B; De Vries, HE (August 2006). "Lipoic acid affects cellular migration into the central nervous system and stabilizes blood–brain barrier integrity". J. Immunol. 177 (4): 2630–7. doi:10.4049/jimmunol.177.4.2630. PMID 16888025. ↑ Lennon, V. A.; Kryzer, TJ; Pittock, SJ; Verkman, AS; Hinson, SR (August 2005). "IgG marker of optic-spinal multiple sclerosis binds to the aquaporin-4 water channel". J. Exp. Med. 202 (4): 473–7. doi:10.1084/jem.20050304. PMC 2212860 . PMID 16087714. ↑ Pascual, J.; Wang, D; Lecumberri, B; Yang, H; Mao, X; Yang, R; De Vivo, DC (May 2004). "GLUT1 deficiency and other glucose transporter diseases". European Journal of Endocrinology. 150 (5): 627–33. doi:10.1530/eje.0.1500627. PMID 15132717. ↑ Klepper, Jörg; Voit, Thomas (June 2002). "Facilitated glucose transporter protein type 1 (GLUT1) deficiency syndrome: impaired glucose transport into brain—a review". European journal of pediatrics. 161 (6): 295–304. doi:10.1007/s00431-002-0939-3. PMID 12029447. ↑ Zipser, BD; Johanson, CE; Gonzalez, L; Berzin, TM; Tavares, R; Hulette, CM; Vitek, MP; Hovanesian, V; Stopa, EG (2007). "Microvascular injury and blood–brain barrier leakage in Alzheimer's disease". Neurobiology of Aging. 28 (7): 977–86. doi:10.1016/j.neurobiolaging.2006.05.016. PMID 16782234. ↑ Nagele, Robert G. (2006). "Alzheimer's disease: new mechanisms for an old problem". University of Medicine and Dentistry of New Jersey. Retrieved 2011-07-22. ↑ Williams, Kenneth C.; Hickey, William F. (2002). "Central nervous system damage, monocytes and macrophages, and neurological disorders in AIDS". Annual Review of Neuroscience. 25: 537–62. doi:10.1146/annurev.neuro.25.112701.142822. PMID 12052920. ↑ Ivey, Nathan S; MacLean, Andrew G; Lackner, Andrew A (2009). "Acquired immunodeficiency syndrome and the blood-brain barrier". Journal of Neurovirology. 15 (2): 111–22. doi:10.1080/13550280902769764. PMC 2744422 . PMID 19306229. ↑ Varatharaj, Aravinthan; Galea, Ian (2016). "The blood-brain barrier in systemic inflammation". Brain, Behavior, and Immunity. doi:10.1016/j.bbi.2016.03.010. PMID 26995317. ↑ "History of Blood-Brain Barrier". Davis Lab. Retrieved 5 January 2015. ↑ "History of Blood-Brain Barrier". The Davis Lab. University of Arizona. Archived from the original on 2012-04-25. Retrieved 2014-03-01. Shityakov, S., Salvador, E., Förster, C. In silico, in vitro, and in vivo methods to analyse drug permeation across the blood–brain barrier: A critical review. OA Anaesthetics 2013, 1(2):13. Derricott, Caitlin (2015). "Using water–solvent systems to estimate in vivo blood–tissue partition coefficients". Chemistry Central. 9 (58). Retrieved 16 October 2015.